Images highlighting the weeklong events surrounding the historic Presidential Inauguration of Barack Obama will go on view April 29 in the Smithsonian’s National Museum of American History’s new exhibition, “I Do Solemnly Swear: Photographs of the 2009 Presidential Inauguration.” More than 30 framed color and black-and-white photographs taken by 15 professional and amateur photographers and two photographic slide shows will be on exhibition through July 12. Museum curators looked through more than 3,000 images to select the exhibition photographs and four murals that record the events surrounding the peaceful American transfer of power between administrations. The photographs on view include new acquisitions to the museum’s Photo History Collection by leading photojournalists, including David Hume Kennerly, the Ford White House photographer; Robert (Bob) McNeely, President Clinton’s official photographer; and Karen Ballard, a Washington, D.C.-based freelance photographer. From Obama’s whistle-stop tour on the way to Washington, D.C., to an intimate moment shared by the President and First Lady as they made their way to one of the 10 official inaugural balls, the exhibition showcases photos taken on the National Mall, the Capitol steps, the Lincoln Memorial, Pennsylvania Avenue and even Times Square. 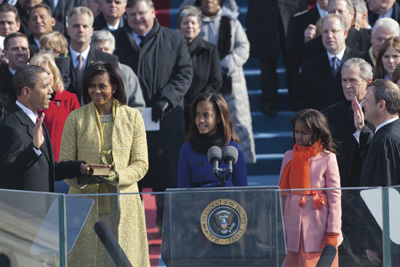 There are two photo slide shows, one with several amateur images shared on the public Internet sites http://photobucket.com/obamaphotobook and http://www.obamaphotobook.com/slideshow and the other presenting a sampling of Smithsonian photographers’ work during the inaugural week, including scenes at the museums Jan. 20. David Kennerly and Robert McNeely were asked to lead a team of more than two dozen photographers to capture the historic moments with exclusive access to inaugural events provided by the Presidential Inaugural Committee. The museum’s exhibition draws from photos taken for the Official Inaugural Photography Project, executed by Epicenter Communications Inc., co-publisher with Kodak of the Official Barack Obama Inaugural Album (www.Inauguralalbum.com) which is available only online and features select pages that can be customized with inaugural visitors’ own photographs. Five Ties Publishing, New York, in association with Epicenter Communications, has published “Barack Obama: The Official Inaugural Book.” Prints of the photographers’ work on exhibition were made by Kodak. The photo slide shows include images courtesy of Epicenter Communications, Photobucket.com and Smithsonian Institution photographers. Among the other photographers whose work is included in the exhibition are Pete Souza, the chief official White House photographer for Obama who was formerly Ronald Reagan’s photographer; Anne Day, who has photographed three presidential inaugurations and whose work has appeared in major newspapers and newsweeklies; and Paul Morse, who served as deputy director of photography at the White House from 2001 to 2007. The Smithsonian has been collecting objects related to presidential inaugurations for more than 100 years, beginning with a panel from George Washington’s inaugural coach in 1882. The photographic history collection, begun by the Smithsonian in 1896, is the first collection of photography in a U.S. museum and holds 12,000 pieces of photographic equipment and 200,000 images that capture the history, art and science of photography. Nineteenth-century photography is well represented, and holdings include paper photographs, equipment and studio set-ups. The history of amateur photography and photojournalism is also preserved along with cameras used by Eadweard Muybridge and the work of 20th-century masters such as Richard Avedon and Edward Weston. The collection began to focus on digital photography following the events of Sept. 11, when many of the initial images were captured and transmitted by digital technology. The acquisition of the 2009 inaugural photographs allows the museum to continue building its research and collecting around the history of digital photography and contemporary photojournalism. The National Museum of American History collects, preserves and displays American heritage in the areas of social, political, cultural, scientific and military history. To learn more about the museum, check https://americanhistory.si.edu or call (202) 633-1000, (202) 633-5285 (TTY).